As an industry-leading aluminium supplier, Duration Windows is committed to helping customers make the most of their business by combining an extensive high specification product range, efficient manufacturing and distribution operations, with a reputation for product innovation, technical competence and quality. We are also very aware that strong marketing is an essential part of any business plan and an important factor in the success of any business. 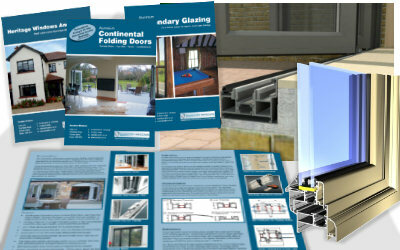 We make sure not to only focus on promoting Duration Windows but to also offer marketing support to our trade customers. Everyone wants to sell more, and we can help you to achieve this. From expert technical advice, to marketing campaigns and providing you with leads, Duration Windows is committed to helping your business grow. We appreciate it’s tough out there, which is why we provide you with innovative products that allow you to differentiate yourself and stand out from the crowd. A broad spectrum of advertising is needed to reach out to people and bring potential customers to you. We can help you to get a foot up with your advertising so contact us today on 01268 681612. Corner Samples - to take to site and show customers. Leads - as a trade manufacturer we pass on supply and fit leads to our trade customers. Unbranded Brochures - request 50 free brochures. Personalised Brochures - customised to better suit your corporate image. Other Literature - we provide user guides, specification guides and all manner of other useful literature. Extensive Image Library - for use on your website, or point of sales literature. Technical Support - contact our technical dept. for expert help and advice. Technical Downloads - available from our website. Extensive Website - a comprehensive sales tool, providing you with all the product information and literature you require. Marketing Campaigns - providing help and advice with any other marketing campaigns you might have be it flyers or editorials. Giving customers a brochure that they can take away with them will act as a reminder of your company, products and services. If you ask our sales department for a brochure you will generally be sent one or two of our Duration branded brochures for each of the products that you have expressed an interested in. However, if you require unbranded brochures then contact our marketing department and we can provide you with 50 unbranded brochures free of charge. We offer a brochure customisation service where we provide you with our brochures but personalised with your company logo and details. This service is provided at print cost. Simply provide us with a high resolution image of your company logo and specify the company details you wish to put on the brochure and we will replace our details with yours. In addition to changing the logo and contact details, we will also change the colour scheme of the brochure to better suit your company’s image. We do a lot of advertising on the internet, in magazines and attending shows such as Grand Designs. As a result we receive countless numbers of leads asking for supply & fit for our products. As a manufacturer we will pass these leads onto you - our customers. Our leads will be given details of three of our trade customers that are in their area and have experience with the product of interest. The more often you deal with us the more often and likely we are to pass on your company’s details.